Preview: Dabang Delhi chief coach Ramesh Bhendigiri on Thursday said that captain Meraj Sheykh had regained full fitness as he gets ready to turn things around for them in their home leg of the Pro Kabaddi League (PKL), starting on Friday. Meraj had picked up an ankle injury during the Kolkata leg and was also not at his 100 percent during the Ranchi leg. But Bhendigiri said that the Iranian star all-rounder has fully recovered -- in a big relief to the capital franchise. "We now have a fully fit squad. We have rotated the players keeping in mind the long PKL season and also that during the home leg, a team comes under strain as it has to play six matches in seven days," Bhendigiri said. Delhi are currently sixth in the Zone A with four wins from 12 matches. They have played one draw and lost seven times. "We are still in contention. Places for the knock-outs are yet to be decided. This home leg can see a lot of movements. So far, we have lost close matches, otherwise our position could have been different," Bhendigiri said. 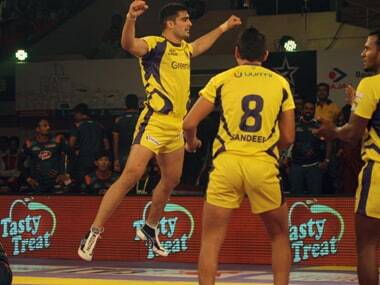 Delhi will begin their home campaign against former champions U Mumba before facing Puneri Paltan on Saturday. "As a team, we are excited to finally play in front of our home crowd and are determined to keep our loyal fans happy by giving them a great show. We have six games at home and with the fans' support will look to climb up the table in our zone," Bhendigiri said. Meanwhile, the franchise announced that it has partnered with Uber to help fans get the quickest and most convenient access to the stadium. Fans also have the chance to earn a discount of 50 percent off (up to Rs 75) on two rides to and from the Thayagaraj Sports Complex. Dabang Delhi have also partnered with the likes of CRY, Swechha, WaterAid India, WWF, Sparsh and Plan India to bring smiles to millions of faces beyond the stadium as well.